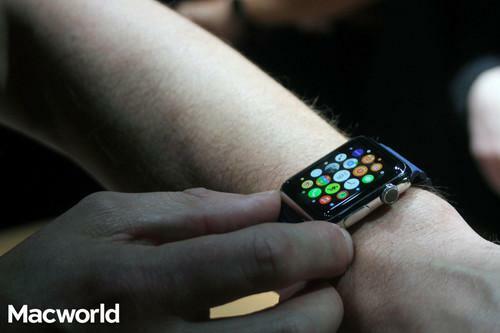 Apple Watch is the touchscreen device that can touch you back. No screen, apparently, is too small for video, even the one on Apple's Watch. Twitter's popular Vine mobile video app will come to Apple's Internet-connected wrist gizmo later this year. During Apple's Worldwide Developers Conference on Monday, Kevin Lynch, Apple's vice president of technology, demoed some new functions, including video, that will be possible on the second version of the Watch's operating system, which arrives in the fall. During the demo, he showed a video of someone clinking drinking glasses on the Vine app. Vine later posted on its Twitter feed that its app would arrive on the Apple Watch later this year. Vine's app lets people record and share looped videos up to six seconds in length. Apple's Watch currently does not support video, but watchOS 2, announced Monday, would allow that capability, as well as new watch faces and other advances like faster app response times. So, like it or not, more video oriented apps are likely to make their way to the Apple Watch, which comes in sizes of 38 or 42 millimeters. Instagram, which is owned by Twitter rival Facebook, is already available for the Apple Watch. But the Instagram Watch app, at least as it exists now, does not include Instagram videos. Facebook, which now has plenty of auto-playing videos in its main app, does not yet have an Apple Watch app. But Apple CEO Tim Cook showed off Facebook on the Apple Watch during a previous event in March, so something from Facebook might officially launch later. Still, no matter how many video apps make their way to Apple Watch, it might be some time before you can record video with the Apple Watch. The first-generation model does not have a camera on it, though it can act as a viewfinder for your iPhone camera.